The wind is blowing fresh snow in our faces. Layers of ice start to stick on my cheeks and slowly, I begin to lose all feeling in my nose. 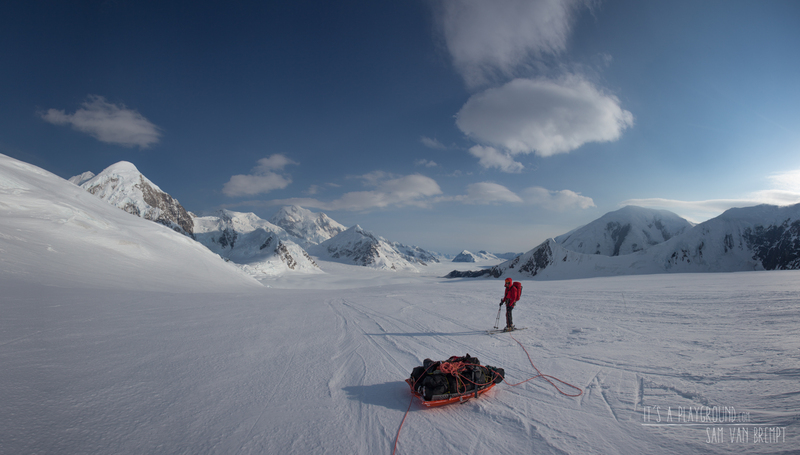 These are the moments when you really start to wonder what you’re doing up in the central Alaska Range. 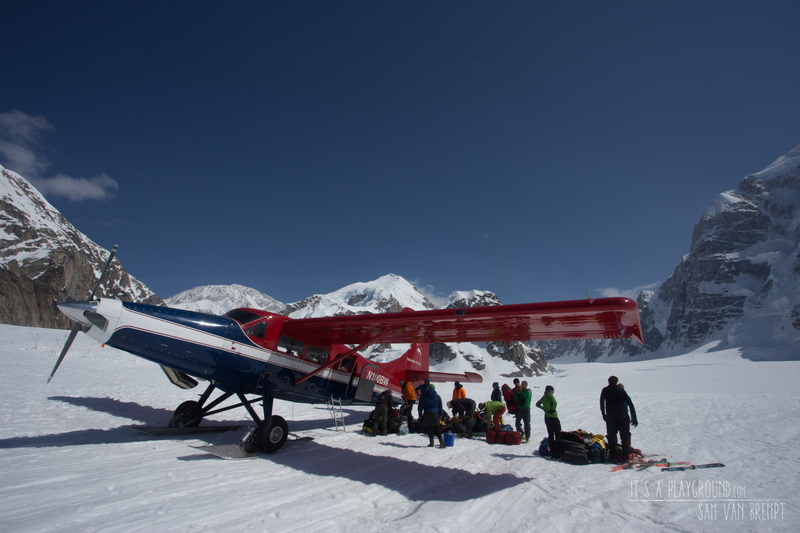 On the 17th of May we left the Kahiltna airstrip late in the morning. Maxime and I started walking on the low angled Kahiltna Glacier. Within a few hours, we arrived at Ski Hill Camp just in front of the first steeper step. 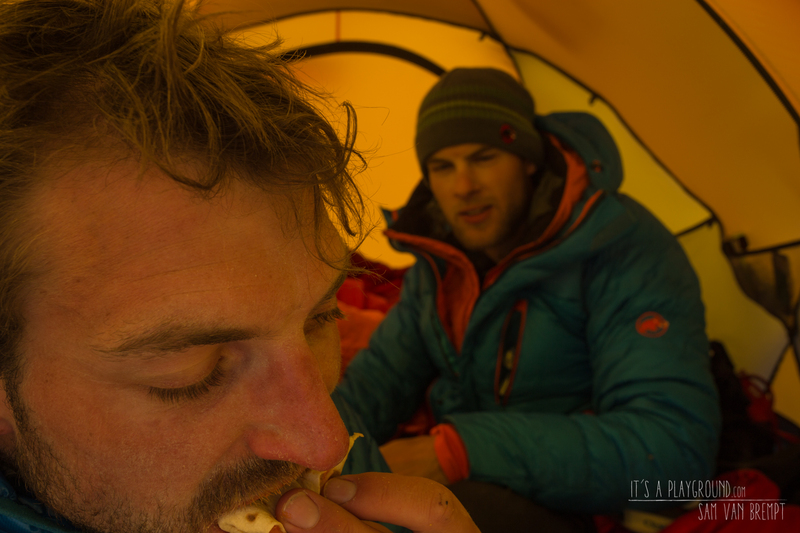 We ate a quick lunch in companion of another Belgian climbing party who, before heading on a 6 months cycle journey, wanted to climb Denali’s West Buttress. While they pitched their tent we moved on. We wanted to make as much progress as possible and came up with the not-so-promising plan to get directly to the 11.000ft camp Now, in the afternoon, it’s a complete whiteout. We don’t know where we are exactly. 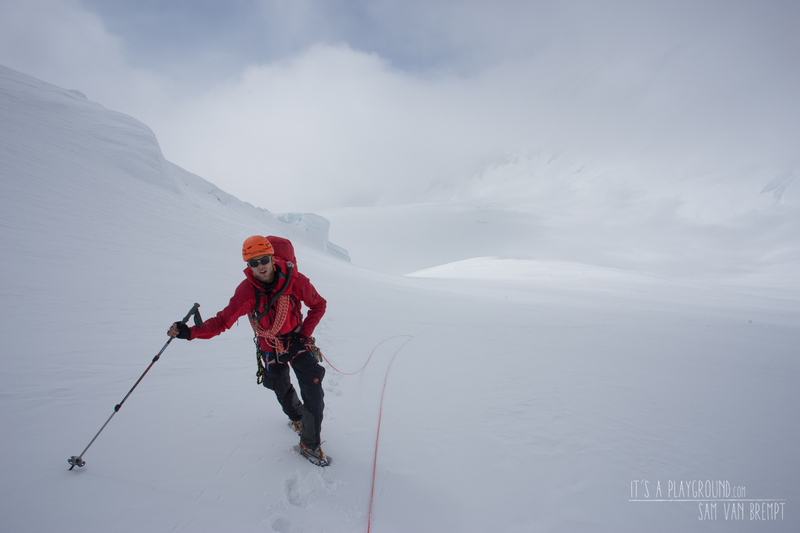 We just follow the trail that is followed by the thousands of West Buttress Denali climbers. As fresh snow slowly fills the old traces, we just look out for the small bamboo sticks planted into the glacier by previous visitors. We spend a lot of energy pulling our heavy sledges. During the years, I managed to slim my pack down to the lightest and most essential gear, but somehow, thanks to my ever-growing photographical kit, the sledge is once again way too heavy. From time to time we take a small pause. I turn around and Maxime is only slightly visible, as a silhouette disappearing into the mist. I take a deep breath before we continue, wondering why I came back to this place. To keep the story short, I will walk over the fact how it feels to lose a close friend in a climbing accident. Although I experienced loss before, I never stood so close to an accident. Nevertheless I think I can say I hit my biggest low ever and slowly had to find my way back up. The fact that I had 4 lonely days to clear my head before I had my first decent contact is something I would never recommend but was helpful in a way. Later, I wrote some small things, trying to explain my feelings, my thoughts and the way I (re)act. As I like to be completely aware about those inner thoughts and feelings. I still remember me sitting in the helicopter. The late evening sun was enlightening the highest peaks. Although I was absent and I didn’t know what to say to the rangers neither the pilot, there was a inner peace. Now that I was in a safe position, I just wanted to wander around in these mountains. That moment, I already realized backing off on climbing was no option. Soon, from meeting climbing partners, I started rock climbing and got back into skiing, alpinism, expedition climbing and so on. 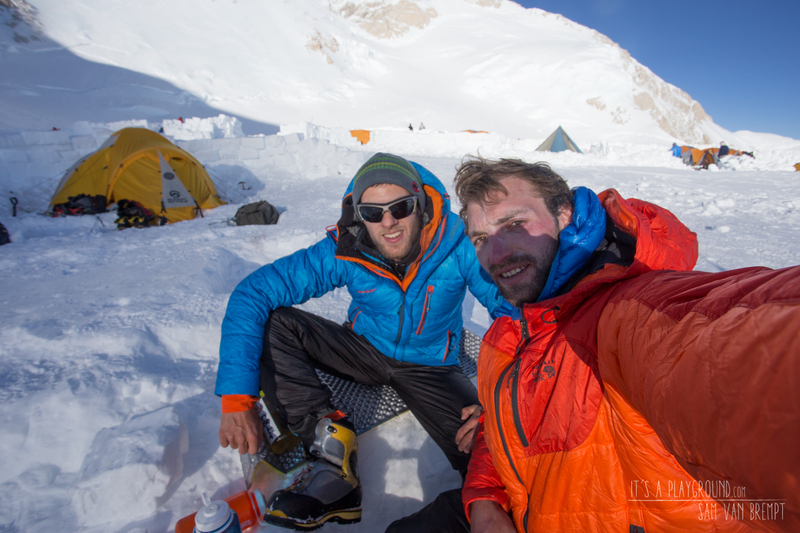 In the summer of 2009, less than a year before the accident with Joris, I lost good friends on the Peruvian mountain Tocllaraju. It was only after my visit to the Cordillera Blanca in 2012, I felt some kind of relief for the first time. More than ever I wanted to go back to Alaska too. Besides I realised that coming back to that place brings me some peace in mind. There is an ever growing curiosity about what and how intense I will feel if I am at the massive South face, the north east fork where Joris is resting, the 14.000 ft. camp where he spent his last 3 weeks or the Cassin ridge itself. It’s like every year around the month of May, my thoughts get drifted to that place. Now, 4 years later, I’m finally back at the Kahiltna Basecamp.  While our experience grew during the years, our dreams and objectives changed. Needless to say, the Cassin always sticks to my mind. But it slowly changed from a physical test piece into a mental challenge and confrontation. 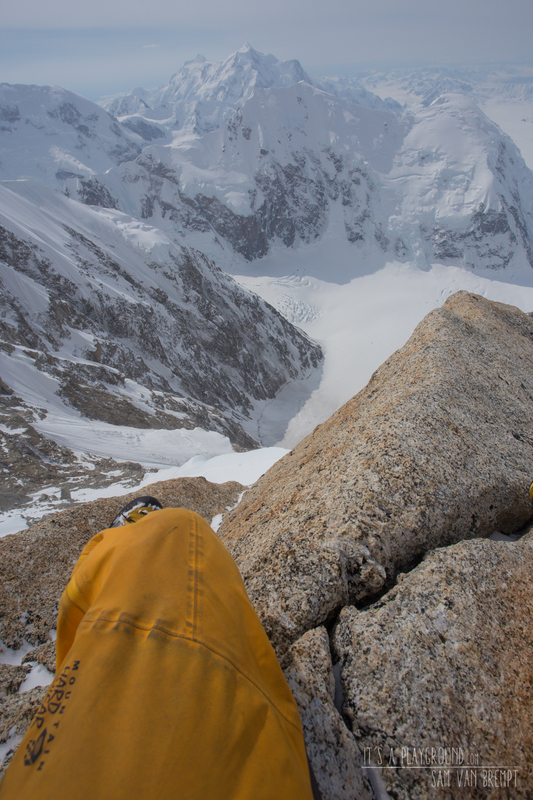 Although I wanted to come back somehow it didn’t feel exciting to come back for only a try on the Cassin Ridge. 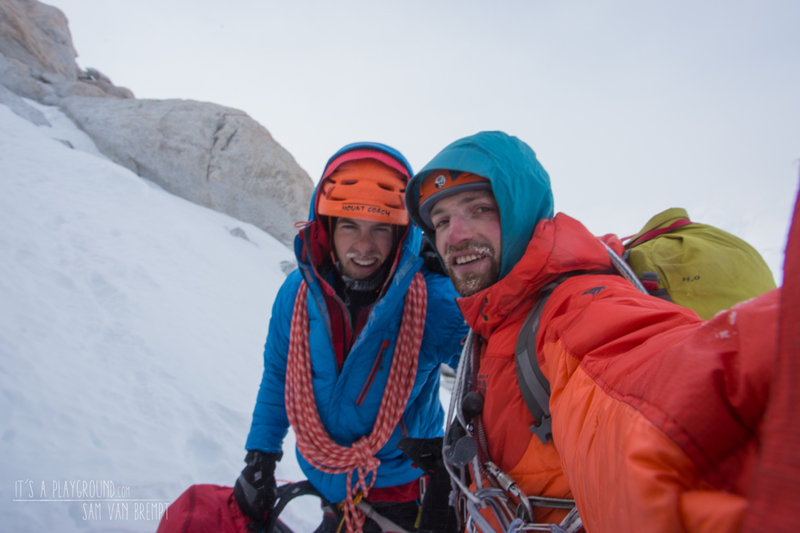 That’s why Maxime De Groote and I opted to climb the Moonflower Buttress instead. The Cassin Ridge became a back-up plan, in case we had some spare time. After spending only 2 weeks in the range, we managed to climb our hardest route ever: a 4 day round trip on the “not so in condition” Moonflower Buttress. Back in Base-camp we take some days of recovery rest. Maxime suffers from a severe toothache and even the maximum amount of painkillers can’t help anymore. He needs to fly back to Talkeetna to see a dentist. Later that evening I walk into Lisa’s tent to get an update about Maxime and the upcoming weather. Lisa is the one who is running Basecamp. 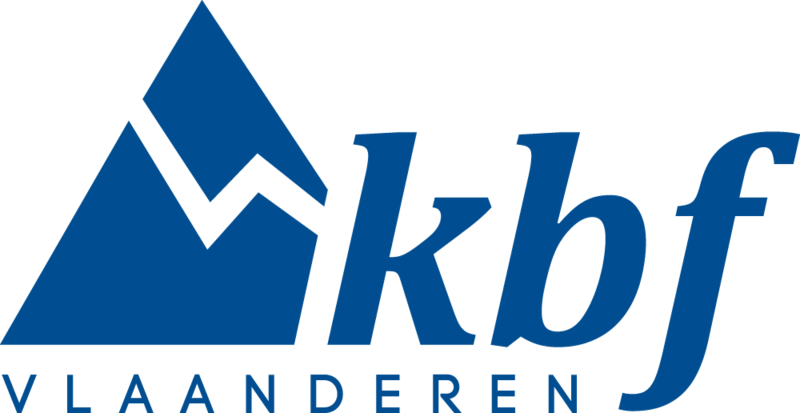 Arranging the flights in and out, helping climbers on their trip, broadcasting weather reports and so on. As she has been doing this for several years, she still remembers the accident of Joris and the young guy who was waiting below the mountain. Gently she asks if it was me back then. We start talking about the accident. “So, then you met the Japanese team?” she asks. Wondering what she means, she points to two tiny down suited men standing before a small tent, melting snow for their tea. It turns out that it is in fact the same climbing party that helped me lower Joris down back then. After 4 years they decided to reattempt the Cassin ridge. As I never managed to get in contact with them I am more than happy to finally talk with them. It turns out I even visited their small hometown in Japan two years ago on a skiing trip. 2 days after he flew off, Maxime arrives back into the range. As he knows he can always please me with food, he brought a liter of cold coke and a pizza. 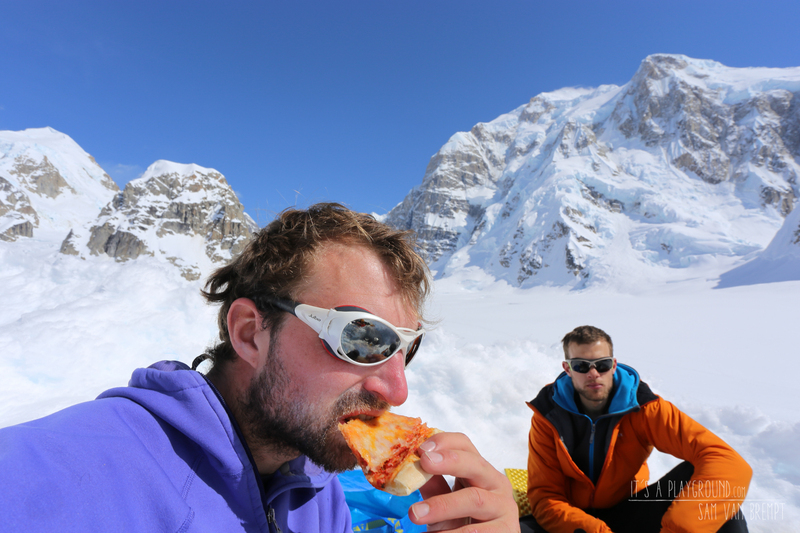 It takes roughly half an hour to fly over to the Kahiltna airstrip so the pizza is cold too. But I’m more than happy to exchange a cold pizza for all the sweets and freezed food we had since we arrived. We take the rest of the day to rearrange our bags. The next morning we are on our way to the 11.000ft camp on the Kahiltna Glacier. By now, late in the afternoon, fresh snow cleared all the traces, we can’t find the 11.000ft camp and the whiteout makes it impossible to navigate to the exact location. 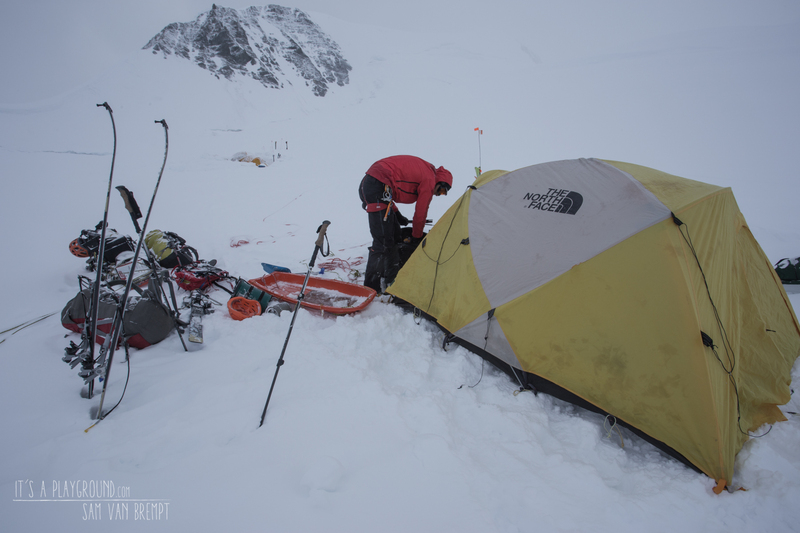 We get tired, loose the motivation to walk on and decide to pitch our tent just next to the path on the glacier. As we zip open our tent in the morning, we finally get a view on the environment. 11.000ft is only 2 hours ahead of us. Our stop 2 hours from 11ft. Arriving at the 11.000 ft. camp, the wind picks up again and starts to blow clouds into the valley. The weather update in the evening doesn’t sound promising. It’s clear that we have to stay for at least another day in this camp and on the downside there is not even a small 2 day good weather window looming at the end of the forecast. Another hauling day finally brings us up to the crowdy 14.000th camp. Since we topped out on Mt Hunter a week ago we thought to be better acclimatized but nevertheless we are glad that we’re finally done pulling those sledges. 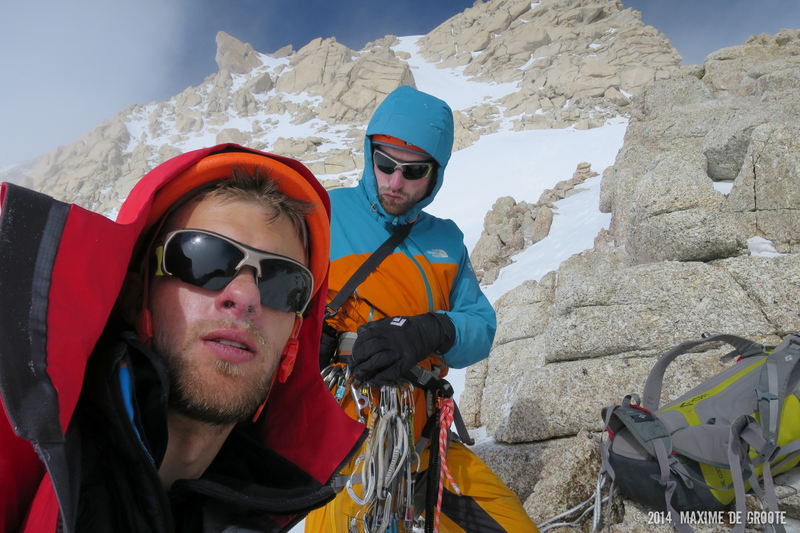 As we knew in advance, from here on we have only a week for further acclimatization and climbing the Cassin Ridge. Call us naïve, but we’re just hoping for the right window at the right time. We go for a small talk at the ranger camp and run into Dave Weber and Mark Westman. Both guys have a long history as ranger and climber in the range. As we tell them that we want to go up for some acclimatization, they remind us about some changes in the National Park mountain rules. 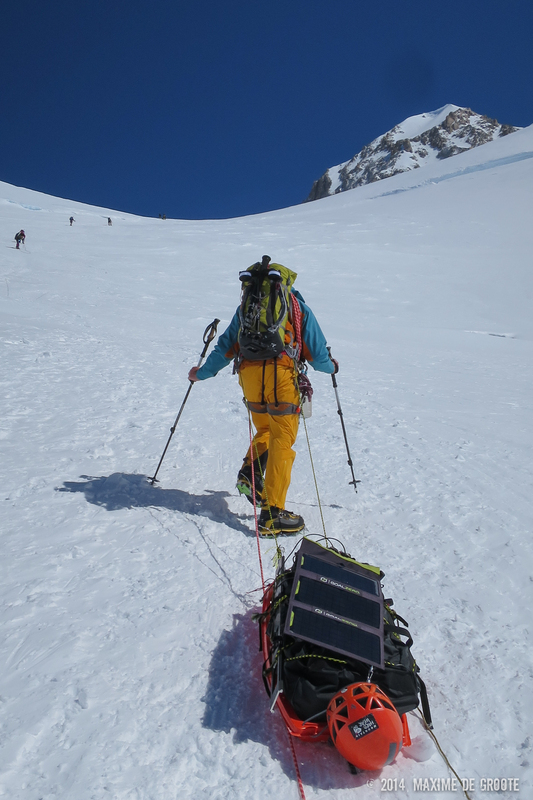 Climbing on the crowded West Buttress, not only do we need to bring plastic shitbags up to 17k ft, we also need to bring a CMC (clean mountain can). There are no crevasses to throw away poopbags so from this year on, it’s no longer allowed to go to the toilet up there without bringing your poop back down. Not too thrilled to drag this 10-liter bucket on the mountain. We’re only partially joking and suggest to use our reactor stove as CMC. Unfortunately they don’t want to make an exception, so we change our plans and decide to climb the West Rib, as the CMC rules don’t apply on this less crowded route. 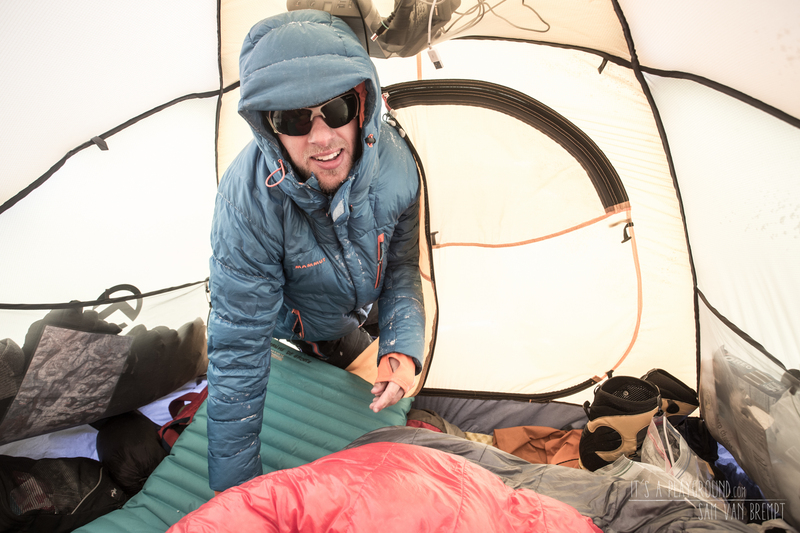 The cold, one of the downsides about climbing Denali, makes every morning really hard. Especially with all this bad weather and the unpromising outlook. I wake up, staring to the rime plastered tent sealing and I only think about leaving theses mountains as fast as possible. It just seems so useless, pushing forward knowing there is only a slight change to attempt the Cassin. 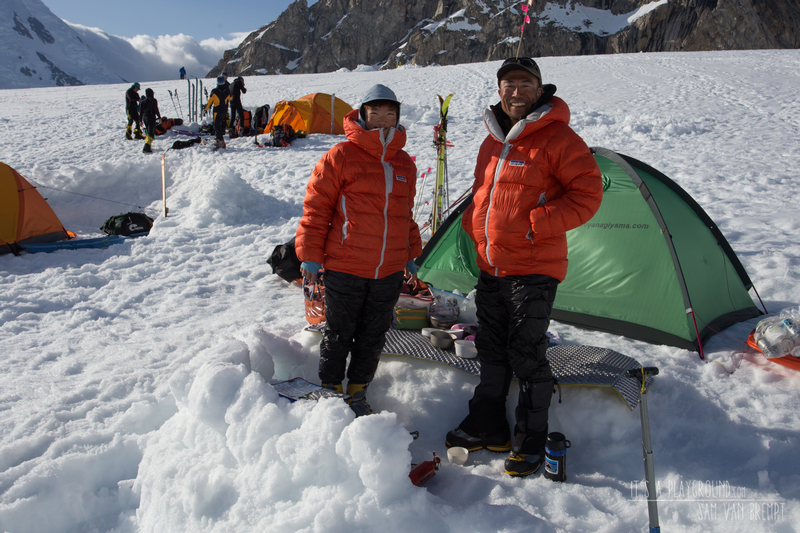 We stay in our tent and wait till the sun shines over the mountain. While the temperature rises so goes my motivation and for the rest of the day time flies. Spending several hours melting snow and cooking till early evening the sun disappears again. The weather reports don’t give any sign on a perfect weather window but we don’t have the time to wait for it. 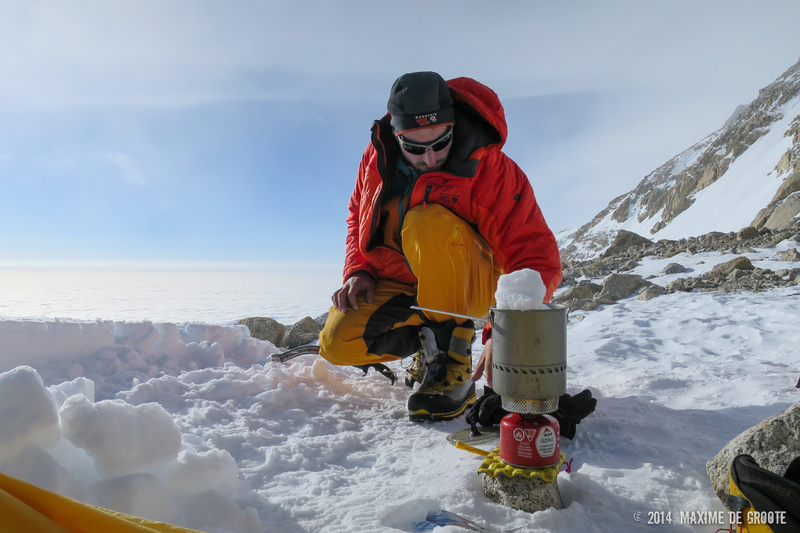 One day around noon, as soon as the clouds clear, we gear up and walk to the base of the west rib cut off. It is easy climbing but at this altitude we feel our hearts pounding in our chest. Early evening we find ourselves high on the mountain. Beneath us, a thick layer of clouds is coming up. Like small islands only the higher ridges and mountains squeeze themselves through it. 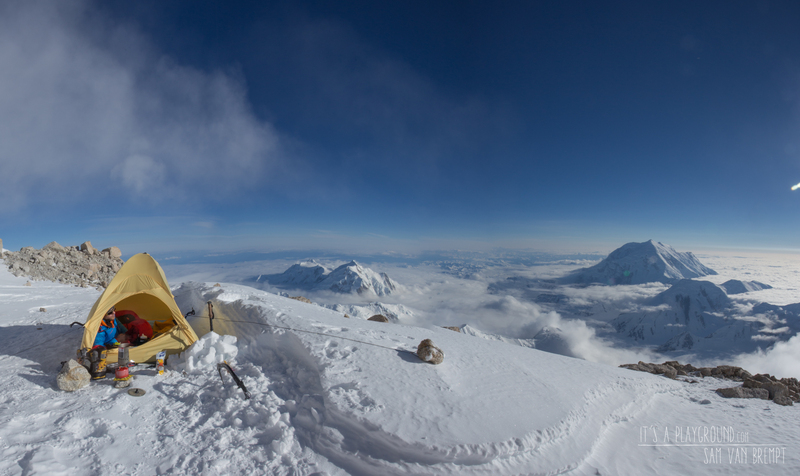 We reach a platform around 17.000ft, the so-called balcony camp where we pitch our tent for the night. 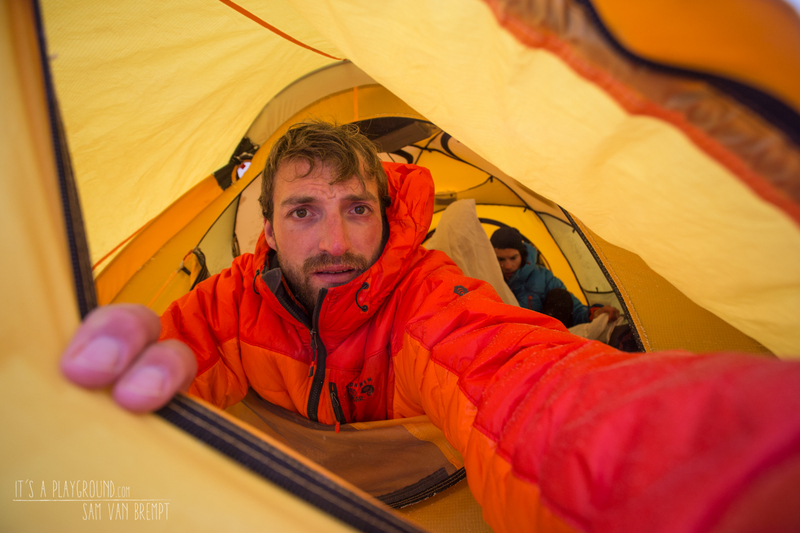 Maxime feels a slight headache as he gets into our single wall bivy shelter. We brew up some soup to hydrate. While digging into my backpack, searching for our freeze-dried meals, I soon discover I forgot the spoon. 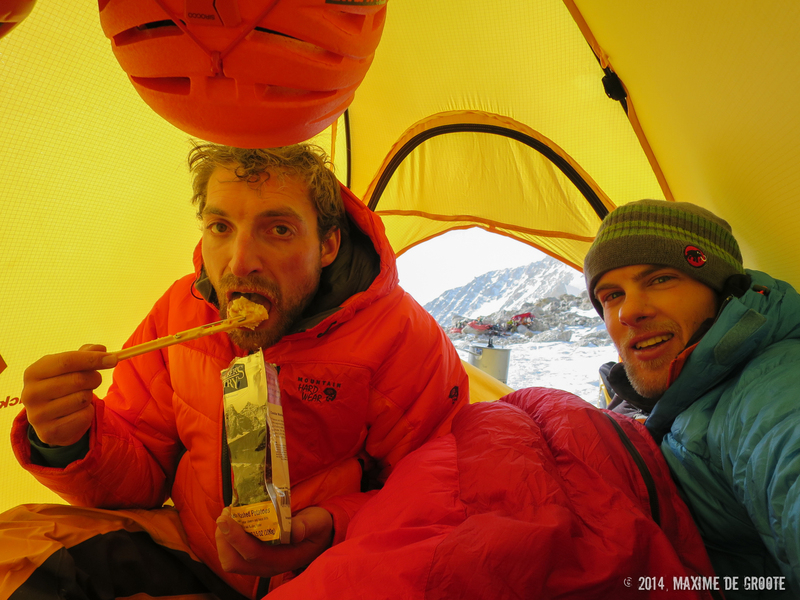 This doesn’t seem to bother Maxime as he quickly discovers a candela to use as a spoon. While the sun sets, the colors show the range at its best but the wind is again picking up. The last weather report tells us that the wind will drop the next morning. Hopefully the forecast is right, as we’re eager to move on. Our Supertopo guidebook warns us that this is a bad place to be in a storm. We take everything we can possibly store in our tent and afraid that my shoes will fly off the mountains, I even strap them to the tent. While the tent fly smashes into our faces, I can’t fall asleep. Maxime and I don’t say a word but I know he ‘s awake to as he reacts to every movement or sigh I make. When it’s early morning, the wind drops and we finally manage to get some hours of sleep. We wake up, still tired, pack our bags and try to heat up with some warm tea. As it is still cold and just standing won’t help we quickly start to our climb over the easy terrain on the upper west rib. 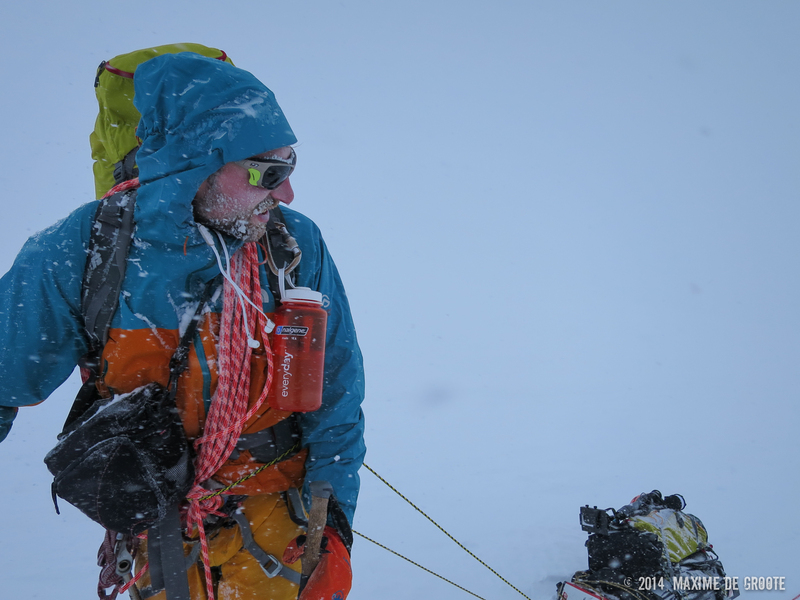 The ridge blocks the sun that is coming up in the east so Maxime suggests moving over to the rib itself. As we reach the ridge, we quickly discover this is no good option either. Despite the heat of the sun we receive the wind in full effect. Within 15 minutes we lose the feeling in our hands and feet. A simple look at each other is all it takes. There is no point in trying to reach the summit. We start to climb down in the direction of the Orient Express couloir and follow this snow couloir to the lower glacier and walk back to the 14.000ft camp. As we reach the camp, the sky is clearing and we get that nervous feeling. Wondering if we were just lame and went down too soon? Later that day, we discovered that all the climbing party’s on the West Buttress made the same decision. 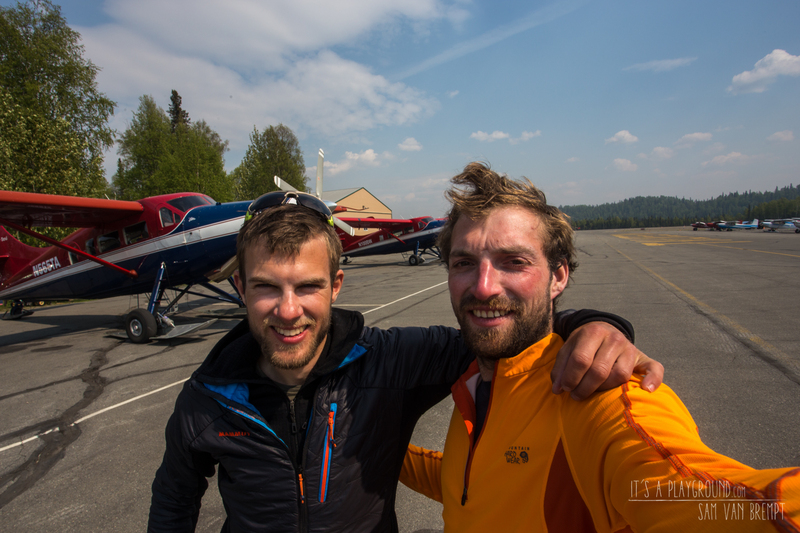 We reached an altitude of 18.000ft and know that if we take a day or two rest, we’re ready to get a try on the Cassin. Our days on the mountain are almost over so the only thing we need and are hoping for is a change in the weather. The next day, when we intercept a new weather forecast, we know it’s over. There is no break in this weather pattern, at least not to get a try on an engaged route like the Cassin Ridge. Frustrated that we spent a lot of energy on nothing, we quickly decide to back to the warm summer weather of Talkeetna. Go Big in Alaska! Mt Hunter, Moonflower Buttress.